Nominally a Grade 2, the $1,000,000 Pennsylvania Derby has a Grade 1 feel this year, as well as a Grade 1 purse, and that, of course, is due to the presence of 2014 Kentucky Derby and Preakness winner California Chrome. California Chrome is even-money on the morning line for this 9-furlong race. But we have an interesting field of eight horses, and there figure to be some nice prices on the toteboard for those who fancy the chances of anyone other than the favorite. 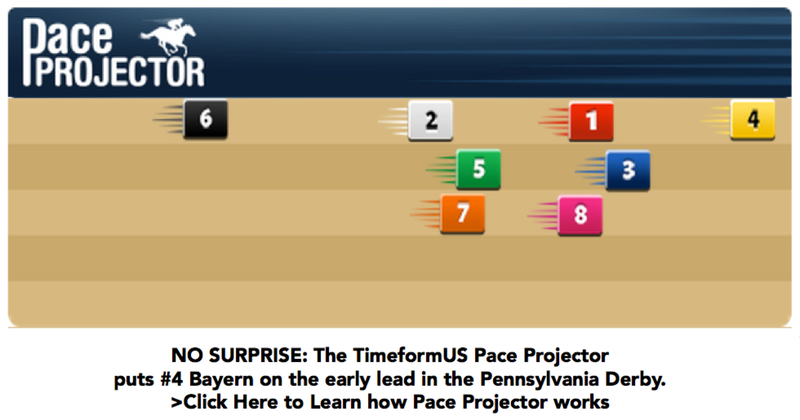 According to the TimeformUS Pace Projector, at the opening half-mile, Bayern will have a clear early lead. Protonico will be a stalking second, closely followed by a ground-saving California Chrome and a wide C J's Awesome. Then there will be another gap back to the next group of three, this one composed of Noble Moon, Tapiture, and Candy Boy. Then there will be a healthy gap back to the trailer, Classic Giacnroll. The pace of the Pennsylvania Derby projects to favor neither frontrunners nor closers. California Chrome (1-1): His scintillating six-race winning streak ended with his disappointing performance in the Belmont, which he came away from with an injured foot. Now he's back after a break of 105 days. His trainer, Art Sherman, is not what we would call a "layoff trainer." Indeed, he gets a rating of only 66 with layoff horses (on a short sample). And it's hard to avoid wondering whether the grinding Triple Crown chase took a toll on California Chrome. Moreover, his connections have expressed a hint of frustration over not being able to get more workouts into their horse, and his workouts have received mixed reviews from the clockers. But let us not go too far with this negativity. California Chrome is a colt who can run speed figures of 117 at his best. He is not going 12 furlongs today. He is not facing Shared Belief. If he runs his race, he is very likely to win the Pennsylvania Derby, and that is a statement that cannot plausibly be made about any other horse in this race, with the arguable exception of Bayern. California Chrome is the most likely winner. Whether he is worth betting on at dimunitive odds is a different matter altogether. Candy Boy (10-1): No match for California Chrome in the spring, he seems to have come into his own of late. He received deceptively difficult trips in both the Los Alamitos Derby (where he launched an early, wide assault on Shared Belief and was taken to the woodshed down that endless Los Al stretch for his trouble) and the West Virginia Derby, where he had trouble of the mundane sort (groundloss) while the winner had trouble of the "highlight film" sort. We have never been big fans of John Sadler shippers. And his circuit switch rating is a scanty 58. But this colt ran his race in West Virginia, Sadler notwithstanding, and he's 10-1 on the ML, and adjusting his recent speed figures for groundloss, were one so bold, would put this colt in territory that can win this race. An interesting horse in this spot. Protonico (8-1): Received a claustrophobic trip most of the way in the Grade 3 Smarty Jones. Then got some breathing room and exploded late for the score. It was a nice effort. It was his first graded stakes win. It earned a respectable speed figure of 102. However, better will almost certainly be needed today. But his trainer, Todd Pletcher, gets a rating of 98 when attempting a repeat victory and 89 in three-year-old stakes. Bayern (7-2): Ran a clunker in the Travers, and we don't think that the 10 furlongs or the fast pace or the drying- out track serve as reasonable explanations, even in combination. Went back to California after the Travers. Worked a couple of times at Santa Anita. And now Baffert sends him to Pennsylvania. Bayern is no stranger to clunkers, nor is he a stranger to running huge races in their wake. His best speed figures, a 118 and a 116, are a match for California Chrome's best. He figures to have a clear early lead in here. Baffert gets a 95 rating with circuit switchers. Bayern has a puncher's chance in here. Noble Moon (15-1): Improving colt is in tough. Classic Giacnroll (15-1): Saved almost all of the ground in the Smarty Jones but was still overpowered by Protonico after that one overcame considerable trouble. We have a hard time seeing Classic Giacnroll reversing that verdict today, let alone dealing with the best that this salty field has to offer. But he does have the best Late Pace rating in the field, a 105, and that could stand him in good stead as far as hitting the bottom of the trifecta is concerned. Tapiture (5-1): Has won two Grade 2s and two Grade 3s. Comes in off solid speed figures of 108 and 107, numbers that can play in here if California Chrome and Bayern fail to bring their best. Overcame showy trouble in winning the Grade 2 West Virginia Derby in his last start. Locked in down on the rail in mid-stretch, his rider checked him hard, yanked him off the rail, and then made an electrifying late run to nail Candy Boy on the line. Tapiture is a contender. What gives us pause is our nagging feeling that there are a couple of horses in here whose best, should they bring it, will render Tapiture's best inadequate to the occasion. C J's Awesome (12-1): Improving colt finds a difficult spot today. Win bet on Candy Boy (assuming that his morning line odds of 10-1 hold up reasonably well). Use Candy Boy under California Chrome and Bayern in exactas. Use Candy Boy and Bayern in multi-race wagers.